Please find the 12 County Libraries listed on this directory, as you scroll down this page. If you move your mouse over any county on the map (left) and if that county has a county library system, your mouse cursor will become a hand pointer. You can click a county on the map, or click a county library name below to view that county information only. The Warren County Library includes the Mays Landing Headquarters Branch along with 10 other branches throughout the Warren County. 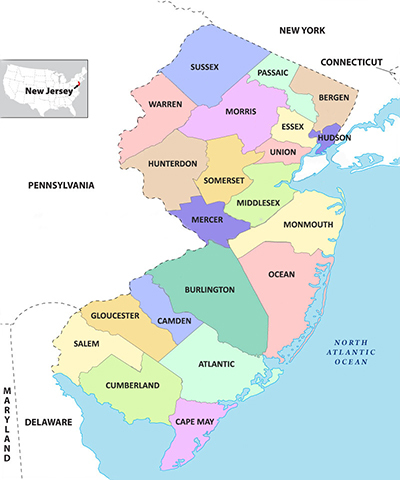 The main branch is located in Westampton, with branches in Bordentown, Cinnaminson, Evesham, Medford, Maple Shade, Pemberton, and Riverton. Member libraries are independently governed, though most adhere to BCLS guidelines. Our member libraries are located in Beverly, Burlington City, Crosswicks, Delanco, Florence, Mount Holly, Riverside, and Vincentown. The Camden County Library System includes the Voorhees Headquarters Branch along with 7 other branches throughout the Camden County. The Cape May County Library includes the CMCH Main Branch along with 7 other branches throughout the Cape May County. The Gloucester County Library System (GCLS) is a group of individual and interdependent libraries that cooperate through a central administrative body to provide a wide range of library services for eligible patrons. Sharing resources enables members of the system to provide more cost-effective and technologically sophisticated services than any could provide operating alone. The Gloucester County Library System consists of five branches and and one independent association library. The Hunterdon County Library includes the Flemington Headquarters Library along with 12 other branches throughout the Hunterdon County. The Mercer County Library System consists of the Lawrence Headquarters Branch along with eight other branches throughout Mercer County. The Monmouth County Library System includes the Manalapan Headquarters Branch along with 12 other branches throughout Monmouth County. The Ocean County Library System has 21 branches including the Toms River Headquarters Branch and serves 32 municipalities within Ocean County. The Sussex County Library System includes the Newton Main Library along with 5 other branches throughout the Sussex County. The Warren County Library includes the Belvidere Headquarters Branch along with 3 other branches throughout the Warren County.